SRI KRISHNA DIVYA NAM reveals yet another side of kirtan extraordinaire Vaiyasaki Das’s high caliber as a devotional singer. At the peak of his accomplished musicianship and devotion, Vaiyasaki Das sings the kirtan songs in elegant mystical ragas that opens and soothes the heart chakra. With a powerful combination of classical vocals, traditional instrumentation, and sweet bhava, Vaiyasaki Das delivers an unmistakable presence to his music. The emotions of sweetness and love intertwined with celestial sounds and the sophistication of instruments like santoor, flute, and esraj, bring the listener to the opening of the heart to the door of divine love. ‘Sindura,’ ‘Shiva Ranjani’ and ‘Sri Krishna Divya Nam’ are soulful and powerful taking you to mystic India, while ‘Bhatialli’ and ‘Lalon Giti’ take you to the soul of Bengal. Each song in this CD is imbued with love. A couple of songs feature the angelic female vocals of Krishna Prestaya. Once again, Vaiyasaki Das has delivered a hit! “KIRTAN EXPLOSION – High energy kirtans.” is a tidal wave of divine love filled with heart evoking emotions and joy. 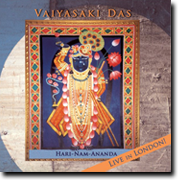 This new live CD from Vaiyasaki Das was recorded in Slovenia with 300 enthusiastic devotees immersed in the ecstasy of chanting the divine names. After the great success and demand of his two previous live albums Kirtan Rasaand Hari-Nam-Ananda, Kirtan Explosion by Vaiyasaki Das comes with renewed shakti, bringing the listener to a wonderful explosion of love. The songs include mantras like ‘Govinda Jaya Jaya,’ ‘Radha-Ramana Haribol,’ and ‘Namaste Sri Radhe’ among other kirtans. This CD not only captures the spirit of the live concert, but the recording quality is superb -a truly devotional live recording of spiritual voices raised in song. Kirtan Explosion is a must-have for your spiritual music collection. 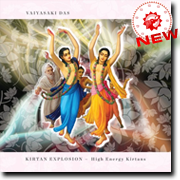 Kirtan Explosion - Produced and arranged by Vaiyasaki Das. Copyright 2008-2009 Vaiyasaki Das (Per Sinclair) All rights reserved. All arrangements and compositions copyrighted. RATHA-YATRA USA – His Divine Grace A. C. Bhaktivedanta Swami Prabhupada first brought the glories of Lord Jagannath to the western world in 1967 to benefit humanity at large. He introduced annual Ratha-Yatra Festivals in the most important cities of the world. The Vedas declare that those who pull Jagannath’s chariot become free from rebirth. 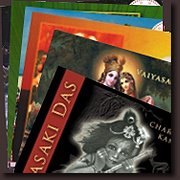 This album by Vaiyasaki Das was recorded live at various Ratha-Yatra Festivals in the USA . The Kirtans bring the listener to the Festival Site to experience the ecstasy of Jagannath’s mercy. The Kirtans glorify the Lord with esraj, sarod, mrdanga, kartals, tambourine and kazoo. 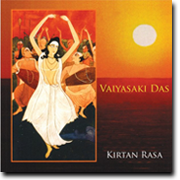 Although recorded in America the kirtans retain traditional Bengali roots with Vaiyasaki Das’s signature Kirtan style. The drumming is outstanding by expert American and Bengali players. Radha-Madhava and Prem-Nam Kirtan are simply beautiful, and Bhagesri Kirtan Parts 1 & 2 feature Vaiyasaki Das’s amazing troop of Bengali musicians. This festive album transports the listener to Ratha-Yatra through the potent sound vibration of the mantras and high-spirited mood of the kirtans. Ratha-Yatra USA carries Jagannatha Swami’s grace and gives joy to the heart. Ratha-Yatra USA - Produced and arranged by Vaiyasaki Das. Copyright 1991-1992 Vaiyasaki Das (Per Sinclair) All rights reserved. All arrangements and compositions copyrighted. THE WAY OF LOVE – Charming Bengali songs elegantly produced and sung by Vaiyasaki Das to delight the heart and refresh the spirit. The celestial voice of Vaiyasaki Das is it’s signature, bhava it’s emotion, and bhakti it’s goal. The musical accompaniment of sarangi, sarod, tablas, flute, mrdanga, kartals, balalaika, synthesizer, and bongos, gives the CD an Indo-Latino flavor - a traditional sound accessible to the western ear. This lovely album includes the gorgeous “Shyamol Sundara Shyam” one of the sweetest songs ever. “Gopinath” is a devotional masterpiece, and the Baul-influenced “Nitai Mile Na” simply spectacular. The Way of Love uplifts the soul through the current of divine love. The energy level of each song connects the listener to Vrindavan, recalling the rhythms of Sri Chaitanya’s Bhakti Movement of ancient Bengal . Each song, written by self-realized masters from ancient India , speaks of eternal truths on loving service in surrender and devotion. 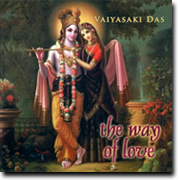 The Way of Love - Produced and arranged by Vaiyasaki Das. Copyright 1995 Vaiyasaki Das (Per Sinclair) All rights reserved. All arrangements and compositions copyrighted. 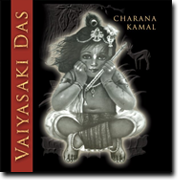 CHARANA KAMAL – Devotional songs by producer/singer Vaiyasaki Das transport you to the realm of the Devas and beyond! Charana Kamal carries you to the heart of mystical India through the music of divine love. The angelic vocals and celestial sounds of harmonim, sarod, esraj, shenai, flute, along with various percussion instruments like tabla, khol, and pakwaj, speak of ancient wisdom. The blend of classical Indian with modern contemporary is personalized for the western ear to awaken the heart to transcendence. The songs in this album, written by poets and saints of ancient India, are now introduced to the western world for the first time. CHAITANYA CHANDRA These devotional songs were recorded in the fall of 1985 at my home studio in Brooklyn, New York. It was my offering for the 500th anniversary of the appearance of Sri Chaitanya Mahaprabhu in Bengal, India in 1486. Sri Caitanya was the incarnation that spread the chanting of Krishna kirtan all over India. This is a lovely album because the songs have georgeous raga melodies with many of the songs ending in the chanting of the Hare Krishna mantra. In 2002, I digitally re-mastered the tracks to improve the sonic clarity and bring out more of the subtleties and nuances of the music and chanting. I am including 2 bonus tracks for this CD, including a rare melody sung by His Holiness Vishnujana Swami. Also included is a raga melody I recorded in Estonia in 2002. May the listeners be blessed by the pure spiritual emotions evoked in these songs! KIRTAN RASA During my European tour of 1995, I was fortunate to visit many diverse temples of Lord Krishna. I was especially eager to chant with the devotees in the countries of the former Yugoslavia, as I had heard that they were extremely enthusiastic. These songs were recorded live at the Sunday Feast program in Ljubljana, Slovenia. The musicians were local devotees and the "choir" chanting in response was comprised mainly of the guests attending the temple that Sunday. There was no rehearsal beforehand, and I was unaware that I was being recorded! So I was impressed to hear how attentively and accurately the crowd sang along as if we had been together for years. The recording was so expertly done by Tat Purusa Das, that the ecstatic mood of that Sunday afternoon has been completely captured. I hope all the listeners will also experience the blissful mood we all shared that day! 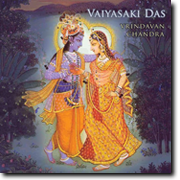 TRANSCENDENCE - Vaiyasaki Das serenades the Divine Couple with delightful melodies that carry the listener to the transcendental realm. These songs have the power to melt lifetimes of ignorance covering the heart. Vaiyasaki Das invokes “Om Namo Bhagavate Vasudevaya” a mantra that allowed Druva Maharaj, a 5 year-old saint from ancient India , to have darshan of Lord Vishnu. He sings love songs like “Sundara Mor,” “Rajrani Mira,” and the sweetest “Jay Radha Krishna” written by pure lovers of Radhe-Shyam, such as Mirabai and Bhaktivinoda Thakur. These poet/saints live the highest romance the soul aspires for, to be united in love to the Divine Couple. Also included is “Radhe Radhe Shyam Milade” a prayer to Sri Radha to introduce us to Krishna , and “Bhaja Hure Mana” a prayer to the mind to focus on transcendence. Every song is an expression of devotion filled with bhava, beautifully accompanied by exotic Indian instruments. This superlative kirtan and bhajan album by Vaiyasaki Das is filled with bhakti and brings sincere followers to the doors of Transcendence. 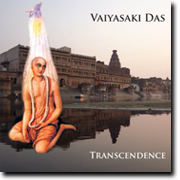 Transcendence - Produced and arranged by Vaiyasaki Das. Copyright 1983 Vaiyasaki Das (Per Sinclair) All rights reserved. All arrangements and compositions copyrighted. HARI-NAM-ANANDA Due to the success of my previous live album, Kirtan Rasa , many people have requested that I do another live album. This collection of Gujarati and Hindi songs was recorded at Bhaktivedanta Manor, outside London, on the appearance day of Lord Nrsimhadeva, Sunday, May 10, 1998. The style of kirtan on this CD originates in the Gujarat province of West India. The mood of this style of kirtan, known as Dhun, is particularly joyous and upbeat. The CD is a digital recording of a live Sunday evening kirtan at the Bhaktivedanta Manor Temple. One can experience the mood of 300 devotees chanting with an ecstatic feeling that transports the listener to a completely different realm of consciousness. Hari-Nam-Ananda - Produced and arranged by Vaiyasaki Das. Copyright 1998 Vaiyasaki Das (Per Sinclair) All rights reserved. All arrangements and compositions copyrighted. 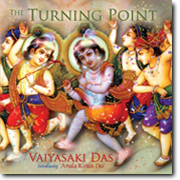 “THE TURNING POINT” reveals yet another side of Vaiyasaki Das’s expertise as a kirtaniya with this Brazilian rendition of ancient Vedic mantras and kirtans. While in Brazil during his 2001 kirtan tour, the idea developed to record these kirtans with a different flavor that the traditional Indian Kirtan style for which he is known. The result is a turning point in his presentation of Kirtan –Kirtan that knows no bounds, nationalities or creeds. ‘Samba Kirtan’ is an incredible opening song. The Turning Point also introduces Amala Kirtan Das, Brazil ’s most renowned kirtaniya, who grew up listening to the music of Vaiyasaki Das and established an artistic relationship. The Turning Point - Produced and arranged by Vaiyasaki Das. Copyright 2001 Vaiyasaki Das (Per Sinclair) All rights reserved. All arrangements and compositions copyrighted. VRINDAVAN CHANDRA - In 1975 I journeyed to India and Bangladesh where I learned the art of Raga Kirtan from the local kirtaniyas, descendants of the original families that have practiced kirtan for generations. Many can trace their roots centuries back to the spiritual renaissance of Chaitanya Mahaprabhu, who introduced Krishna Kirtan in the 16 th Century. In 1982 I returned to the West and did a concert tour of America and Canada. All the concerts were recorded and I chose the best of these live recordings which became my first album, Vrindavan Chandra. Because they are recorded in a live temple atmosphere, there is a special feeling that comes across that is generally not present in a studio recording. The listener will be transported to the spiritual dimension, almost the same as being right there at the concert itself along with everyone else. As you are inspired by the chanting please don’t neglect to turn on your friends so they may enjoy a similar experience. 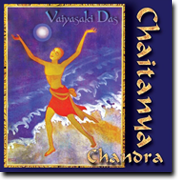 Vrindavan Chandra - Produced and arranged by Vaiyasaki Das. Copyright 1982 Vaiyasaki Das (Per Sinclair) All rights reserved. All arrangements and compositions copyrighted. BEST OF VAIYASAKI - A tribute to George Harrison's devotion to Lord Krishna, featuring all the most requested songs from people over the years. Best-seller. 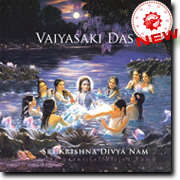 A great first CD for those who are unfamiliar with the music of Vaiyasaki Das. 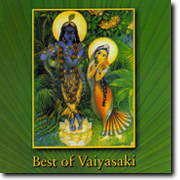 Best of Vaiyasaki - Produced and arranged by Vaiyasaki Das. Copyright 2001 Vaiyasaki Das (Per Sinclair) All rights reserved. All arrangements and compositions copyrighted.